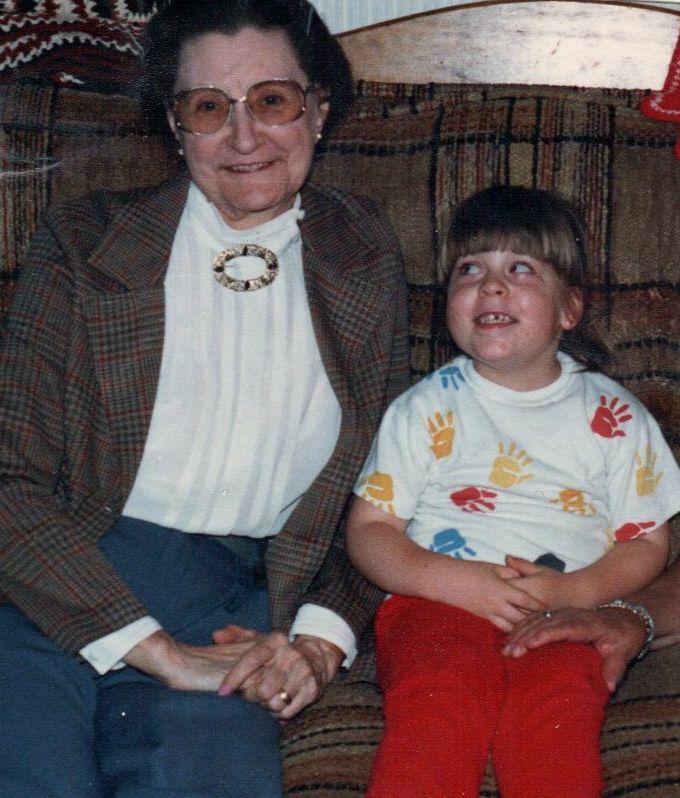 My Grandmom, me and my ridiculous face. The year? 1988. I was four years old and that was my favorite shirt. After many months of deteriorating health, my grandmother passed away peacefully on Monday July 18th at the age of 91. More than just an extension of the family, my grandmother was also a roommate, and a part of our household for over twenty years. 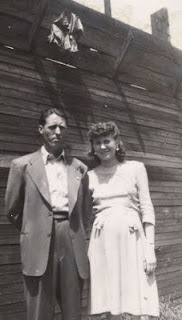 My grandfather passed away the same year this photo was taken. And when my grandmother expressed concern over living alone, my parents opened the door to their home. Less than a year after, my sister came screaming into the world, as babies often do. And when the smaller bedroom was furnished for a nursery, my grandmother and I moved in together to share the larger bedroom. She would style my long hair into a single braid, to keep it from knotting when I tossed and turned in my twin sized bed. And when we were settling in for the night, we were sure to leave enough time for a few episodes of The Golden Girls. I didn't get the humor then. But I do now. Those sassy ladies...sharing stories over cheesecake and tea! 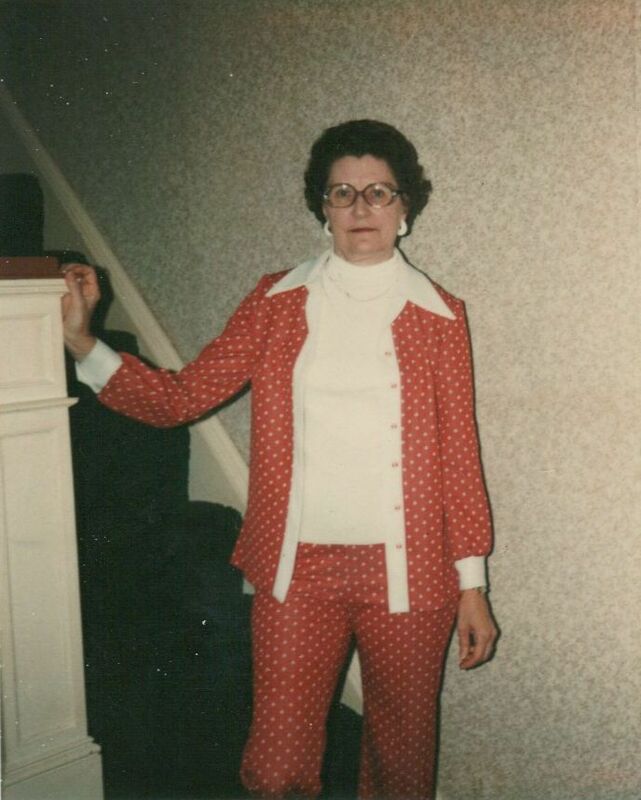 And speaking of sassy.... Would you just look at that polka dot polyester number? While we did have our differencces, especially during my teenage years, we also had remarkable similarities. We both enjoyed a good laugh at a bad horror movie. And we were both very put-together people. 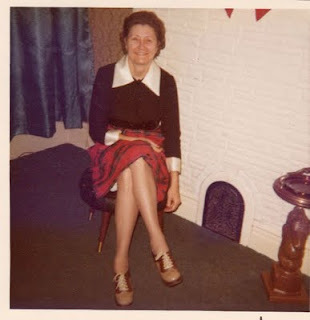 Like me, my grandmother was always mindful of her appearance before leaving the house. While I'm not quite as fashion-forward to be able to sport a polyester suit, I'm not seen publicly without makeup. Ask anyone. My grandmother was the exact same way. Her penchant for costume jewelry, a collection thanks in large part to the QVC network, was worn proudly with coordinating outfits. She called blush "rouge" and wore it even to the doctor's office. This is the grandmom I know. Though in her later years, when in declining health she had a low morale to believe she could still enjoy herself outside of the home, I still like to remember her as she was...with her faux pearls and her rouge. But there was another woman I did not know, one long before my time. This was a woman who believed frugality was a virtue and lived it daily. She provided for her four children. She made sure they had food on their plates even if it meant she was going to bed hungry. She scrimped and saved enough money to buy new outfits for them come Easter Sunday. She sacrificed and managed with what she and her husband had. And yet even then, in a collapsed economy she managed to look fashionably put-together. On Friday afternoon, there was reverent silence, punctuated with the occasional sniffle in the limousine on the way to my grandmother's burial. And then suddenly, after reflecting on the Pastor's words, my aunt made an astute observation. That my grandmom, though she enjoyed getting dolled-up, in her younger years thought herself "homely looking." And this was undoubtedly due to budgetary restraints. But amazingly enough, in seeing photos of her, you would never know of that perception. She was anything but homely. In sorting and dividing her collection of rings, necklaces, bracelets and brooches, it's easy to see that my Grandmom had a flair for adornment. But she was also incredibly sentimental. She saved so many old photographs, postcards, dried and pressed flowers. We even found remembrances from when her children were in grade school. Though I did not know her at that time, I have decided to keep a lot of photographs from when she was a young woman, not far from my age now. Any time I look at those photographs...or watch a b-horror movie... or put on a strand of her faux pearls...I'll remember her. And though now I remember her with a tear, I know soon I'll remember her with a smile. Nice pix, they remind me of my grandmoms-they were of an earlier era but both frugal frannies too. My Nana left 5 jewelery boxes full of costume jewels, my Gram a house full of mid century furniture - they both had great taste! It's best to remember them from the good times, and to pass on their wisdoms! Very sweet post! I am so sorry to hear of your grandmother's passing but enjoyed reading your lovely and loving descriptions of her in tribute. @ LoriC: Well said. Remembering the good times seems hard sometimes, but I think it will get easier. And boy do grannies love accessorizing. Wow, a whole house of mid-century furniture...that's a lot of memories. @ cfb: Thank you for your condolence. I am glad to be able to share a bit about my grandmom with my readers. I'm sure everyone has lost someone important in their lives. But maybe reading others' experiences can help with self-reflection. This is such a heart warming tribute. She sounds like she was an amazing woman and will live on very fondly in your hearts. She must have touched so many lives in a wonderful way :) My condolences for your loss. Thanks, Amber. She was a pretty awesome Grandmom! Aw, a sweet tribute to an amazing women and a tradition of thrift going down through the generation. My hyper-frugal Hispanic grandmothers (they bought nothing but the NECESSITIES for, eh, DECADES) have passed that legacy down to me, too.